Example: The example Alerts Manager Window shown below illustrates three common alert conditions. In each of these examples, the alert notification will repeat every five minutes once the alert is triggered. The first alert is set to trigger when a trader's P/L is less than -$1,000. 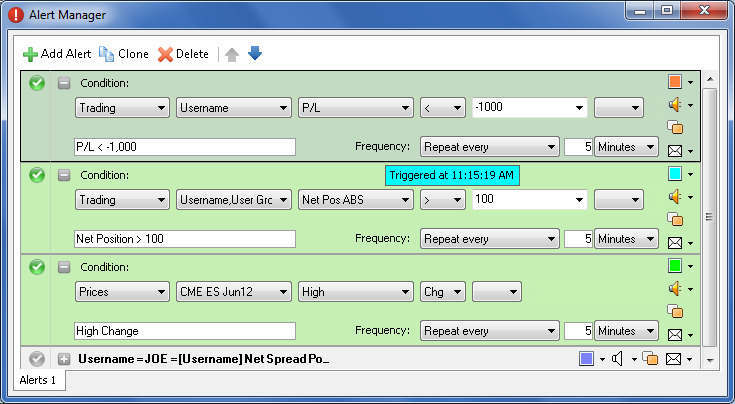 The second alert is set to trigger when a trader's Net Position Absolute is greater than 100. And, the third alert is set to trigger when the CME ES June 2012 contract reaches a new high, (e.g., the value of the current high changes). Notice when the second alert triggered. at 11:15 AM, it color-coded the appropriate row in the Position Window and displayed a popup message box.